What we are celebrating in today’s feast is the fact that prison bars cannot silence truth. John the Baptist was not asked to renounce his faith; indeed Herod was probably very interested in John’s faith and may have even asked him about it on occasion. Not that he wanted to convert, mind you, but he just seemed to have a kind of morbid fascination with the man Jesus, and anyone who followed him. But the real reason that he kept John locked up was that Herodias didn’t like John, who had a following, publicly telling them what they should and should not do. Herod’s taking his brother’s wife was not permitted in Judaism, but it would all blow over if John would just stop talking about it. But that’s not how the truth works. And John’s one purpose in life was to testify to the Truth — Truth with a capital “T” — to point the way to Jesus. So he was not about to soft-pedal the wrong that Herod and Herodias were doing. And that was something Herodias just could not live with. As soon as the opportunity presented itself, she eagerly had John beheaded and rid herself of his prophecy. But that didn’t make her any less accountable to the truth. This could be a rather sad feast. The end of one who worked hard for the reign of God, and over something seemingly so silly. But, as St. Bede the Venerable says of him: “There is no doubt that blessed John suffered imprisonment and chains as a witness to our Redeemer, whose forerunner he was, and gave his life for him. His persecutor had demanded not that he should deny Christ, but only that he should keep silent about the truth. Nevertheless … does Christ not say: “I am the truth?” Therefore, because John shed his blood for the truth, he surely died for Christ. And so, for those of us who are heirs of the Truth, this is indeed a joyful feast. John the Baptist could not keep silent about the truth, whether it was truth with a capital or lower-case “T”. We must not keep silent about the truth either. We are called to offer our own lives as a testimony to the truth. Today’s gospel has Jesus taking the Scribes and Pharisees to task for forgetting what is really holy and treating things as sacred while ignoring God who is holiness itself. Apparently, they thought that swearing an oath by the gold of the temple was more binding than an oath simply sworn on the temple itself: but, Jesus asks, isn’t the temple what makes the gold holy? And they confused swearing an oath by the altar and by the gift on the altar. They had forgotten that the altar is what makes the gift holy. But even more than that, they had been so caught up in details, that they forgot that God is holy, and makes holy whatever can be called holy. Now, Jesus isn’t saying that people should disobey the first and third commandments, using God’s name as an assurance of an oath. Swearing by the name of God isn’t to be taken lightly. But what he is saying is that the Scribes and Pharisees needed to straighten out their flawed notion of holiness. God is holy; and he alone makes holiness. So today might be a call for us to take a moral inventory of our own notion of holiness. What have we been putting before God? What do we hold sacred? Do we have idolatry in our life? Do we sometimes forget that, as we say in the Gloria: “you alone are the holy one, you alone are the Lord, you alone are the most high…”? On this, the octave day of the Assumption of Mary, we celebrate another great Marian feast, that of the Queenship of Mary. Today we celebrate the fifth glorious mystery of the rosary: Mary is crowned Queen of heaven and earth. The Queenship of Mary has been celebrated ever since Pope Pius XII instituted this celebration in 1954. But the feast itself is rooted in Sacred Scripture. In the Old Testament, the mothers of the king had great influence in court. Certainly this would be the case between Mary and Jesus; we know that Mary’s intercession is a powerful force for our good. The Queenship of Mary, though, is most properly understood as a sharing in the Kingship of Christ the King. St. Paul speaks of the crown that awaited him after a long life, filled with fighting the good fight. And we know that that same crown – the crown that comes from Christ himself – awaits all who believe in Jesus and live lives of faith. The origin of Mary’s crown, I think, can be seen at the very end of today’s Gospel reading. Having heard the overwhelming news from the angel Gabriel, Mary responds in faith: “Behold, I am the handmaid of the Lord. May it be done to me according to your word.” Her faith, a faith that responded to the Lord’s call even though the details were not clear, is the kind of faith we’re all called to model. This kind of faith responds to God’s movement with absolute trust in his providence. Mary models that kind of response for us, and perhaps her reward, too, is a model of what we can hope to receive. Just as she responded in faith and was rewarded with a crown of glory, so we too can hope to have the same crown if we live the kind of faith she did. So the question today is, what is it that holds us back? The rich young man seemed to have it all together: he acknowledged Jesus as the good teacher, so he must have been familiar with what Jesus said and did. He says he kept all the commandments, so he certainly had a religious upbringing and was zealous to follow the law. But, with all that, he still knew that something was lacking. “What do I still lack?” he asks. When Jesus reveals that the next step in following the Gospel involves letting go of his worldly possessions, he finds that to be somewhere he can’t go. He had many possessions, and he wasn’t yet ready to give them up. So back to my first question. What holds us back? Is it many possessions? Or is it our work, or power, or what the neighbors might think. It could be that we don’t want to get out of our comfort zone and follow Christ according to the way he is calling us. Whatever it is, it involves letting go – giving up what is not God and clinging to him alone. It’s not that Jesus didn’t want the rich young man to have money. He wanted him to have eternal life. And whenever we cling to what is not God, we are in grave danger of giving up eternal life. We have to be ready to let go of whatever holds us back from accepting the life that God wants for us. What he has is so much better than whatever it is we’re holding on to. So the question is, will we give up what is holding us back, or will we give up eternal life? We’re going to have to live with the answer to that question for a very, very long time. “As for me and my house, we will serve the LORD.” My family has had a plaque with that very verse on it for as long as I can remember. This has always been one of my favorite quotes from Scripture. But it certainly is a hard thing to say, and Joshua makes that very clear in today’s first reading. Serving the Lord makes demands of us. We are called to live the Gospel and serve the poor and love everyone as we love God and forgive, and so much more. We are also told that we have to turn away from the worship of other gods, whatever those might be for us. Are they the gods of wealth, success, prestige, or self-interest? We must turn away from them. Are they gods that hold us back, bound to our own comfort, reluctance, or apathy? We must cast all of that out. Serving the Lord requires nothing less than total self-giving, because the Lord has first given everything to us. And so we have gathered here this evening to celebrate the life of Mary, Mother of God, the first of the disciples of Jesus her son. What is important for us to see in this feast is that it proclaims with all the joy the Church can muster that what happened to Mary can and will happen for us who believe. We too have the promise of eternal life in heaven, where death and sin and pain will no longer have power over us. Because Christ caught his Blessed Mother back up into his life in heaven, we know that we too can be caught up with his life in heaven. On that great day, death, the last enemy, will be completely destroyed, as St. Paul tells us today. The fathers of the Church teach us to “love what Jesus loved when he was on the cross, and despise what Jesus despised when he was on the cross.” We get that same kind of message from Moses today in the first reading. He tells the Israelites that their God loves the widow, the orphan, and the alien, and because of that, they too must love the widow, the orphan, and the alien. That is actually becomes a common theme of all of the prophets. In our day, loving what Jesus loved when he was on the cross might mean reaching out to those in need: the poor, the hungry, the homeless, those oppressed in any way. It might mean binding up wounds: old hurts, casual slights, or pervasive anger. It means forgiving as we have been forgiven, freely and perhaps unilaterally. We are called upon to extend ourselves and to go beyond our own pettiness to love sacrificially. We might not be nailed to a cross, but we may well have to die to our own interests and needs in order to love as Jesus calls us. What do we have that is not God’s gift to us? The Psalmist says today: “He has granted peace in your borders; with the best of wheat he fills you.” We benefit eternally from the great sacrifice of Jesus on the cross. As we remember the grace we have been given in celebrating the Eucharist today, let it be our prayer that we would come to love as he has loved, no matter what the cost. 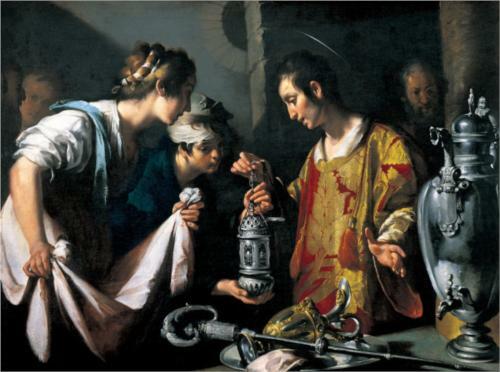 A couple of weeks ago on my vacation, I visited the Saint Louis Art Museum and saw a painting of Saint Lawrence distributing the wealth of the Church to the poor so that the Prefect couldn’t have it. It was painted by Bernardo Strozzi around the year 1625. That was one of my favorite paintings there in the museum. Now, this whole story is saintly legend. We don’t know if it is true or not. But it is a beautiful story that makes us reflect on Jesus’ call in the Gospel today: “Whoever loves his life loses it, and whoever hates his life in this world will preserve it for eternal life.” We who would be followers of Christ are called to know what the real treasures of life are, and to be willing to sacrifice to protect them.